EA's John Riccitiello refutes earlier reports that he called the music genre a "falling knife." EA CEO John Riccitiello feels he was misrepresented in a recent Bloomberg article where he was quoted as saying that purchasing Rock Band developer Harmonix would be like catching a falling knife. On the contrary, Riccitiello told Kotaku he believes that music games will bounce back from their major dip in sales, but he also said that the skateboarding genre won't be so lucky. Riccitiello said he "thinks the music genre is going to recover," but he admitted that he doesn't know how. He points to the possibility of a new innovation in the genre, saying it could become "dance-based." Dancing games like Just Dance are already demolishing at retail, so Riccitiello could be on to something. Harmonix's Rock Band and Activision's Guitar Hero might not be doing as well as they used to, but Riccitiello still likes Harmonix and notes that the studio's Dance Central is a game that could lead the way for the music genre's recovery. He clarified that his comments in the previous article didn't mean that he thinks Harmonix is a "falling knife" at all. Riccitiello continued: "What I said was Alex [Rigopulos, co-founder of the studio] is a great developer, Harmonix is one of the great developers of all time. They've got the leading dance product and maybe the leading game full stop on Kinect and the question was what investors might be thinking about it. [I said] the nervous investor would be worried about the decline in the music sector feeling like a falling knife. The only part of that conversation that got reported was the 'falling knife' part." He added that Harmonix was an innovative company and at least partially responsible for the creation of the music genre he feels will recover. However, the beating that skateboarding games have taken lately with the Tony Hawk series' poorly received last two entries has convinced Riccitiello that skateboarding games are dead. "When it comes to action sports, I think that's going to be an an ongoing exciting genre," he said. "But at least for the level of excitement out there, skateboarding seems to have run its course as the representative example in that broader genre." He noted that EA's NBA Jam is a good example of an action sports title that will keep the genre going instead. It'd be quite sad to see the skateboarding game die, because the early Tony Hawk games were innovative, really fun, and kept improving with each release. 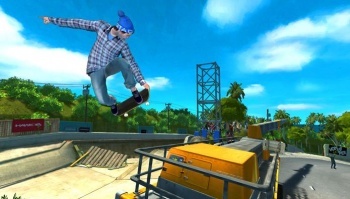 At one point the series just hit a wall, and though Skate brought a fresh look at skateboarding games, it didn't sell like Tony Hawk once did. It'll be interesting to see if Tony Hawk, Skate, or a new series can breathe life into skateboarding someday.